but those little piglets are so adorable…. It’s hard to resist such a cute pig! Load the car with everything I think we will need- buckets, walking sticks, water. Kids just fed the last of the pig food to the pigs. Don’t want to buy another 50lb bag of food, call a friend. She has spare food- yippee! Kids are finishing their last summary page/ thank you letters for weigh in, under threat. Pigs are not accepted without them and we are NOT bringing a pig back home! My husband is already eyeing up their pen as a potential veggie garden. My son puts air in the trailer tires. Early night. Not going to be able to sleep. Am excited and worried all in one. Big day tomorrow! Hardly slept and wake up obscenely early. Make coffee that no one drinks. Tell the kids I’ll buy doughnuts on the way to the fair. Get pigs loaded onto our little makeshift trailer. Tires are flat! My husband puts air in the trailer tires and moves trailer out front. Tire goes flat again. We will never make it to the fair! Check in time closes at noon. 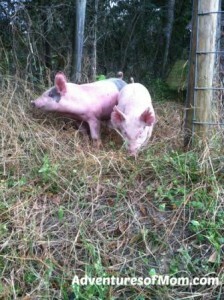 A fellow pig-showing family swoops in to rescue us and we reload pigs onto their trailer (thank you Scott & Melissa!) . I follow the trailer to the fair. Still early, the weigh-in line wraps around the entire parking lot. This is going to be a LONG morning and I already smell like pig. Cold wind is freezing. We hang outside the trailer talking. My husband arrives with doughnuts! YAY! I go off in search of coffee. Make do with hot chocolate instead. Am stressed already. How did these girls get to be so big? 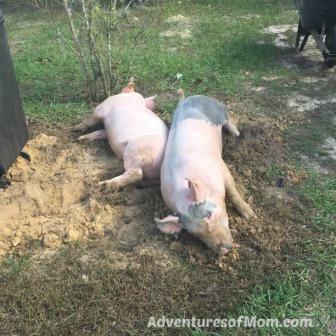 It’s a pig’s life! Tense, nail-biting moments at weigh in. Minimum weight is 230lbs and already many pigs have been turned away. They also must have a certain percentage of back fat- how can you control that? Our son’s pig (CHOPPY) is a monster, weighing in at 347 lbs! Whoa, how did she get so big? She slid by just under the back fat amount. 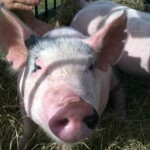 Our daughter’s pig (LUCY) gets in at 255lbs. Now we know who was eating all that food! Weigh in area is total chaos, but there are many fair kids helping out to keep things running smoothly. We run the pigs to their assigned stalls in the barn. They separated the pigs and we have to find an official to approve letting them share a stall, as we only brought one feed dish and one water canister. We move Lucy to Choppy’s stall. Our daughter is among the older kids now and receives lots of helpful input from the kids around them. Tomorrow morning is the showmanship competition. 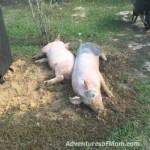 We help one of the high school girls wash her pig and she helps us with Choppy & Lucy. It is now one o’clock and I am wet, cold and stink of pig poop. The kids feed the pigs, using their friend’s food and we stay for the mandatory pig meeting and the first of the competitions. It is after 5. Competition is over. I am tired and cranky and am hating being at the fair. The pigs have been eating like crazy. I realize I can’t keep borrowing food and run over to the nearest feed store to pick up a bag. It’s a 40 lb bag. Am guessing we will have a lot left over. Tell the kids to share it with their stall neighbors. It is nearly 7 now. We leave the fair again, stopping off to grab a Subway. As we head home, tired and stinky in the car, our daughter starts raving about how wonderful and helpful everyone is at the fair and how it is the best thing ever. I love the fair. Choppy weighed in well over 300 pounds but thought she was a ballerina. Today is the longest day of the fair, with competitions starting at 9am and the last one starting at 6pm. We live too far to go home and come back. I throw a sleeping bag and some books into the car and we head out early after a scrambled egg breakfast. It is cold this morning. Check the Showmanship sheets. It will be awhile before they are up. Help wash the club pig and manage to get soaking wet and muddy. Kids get changed and are brushing their pigs for the showmanship event. Parents are chased out of the barn, so I sulk off to the auditorium, wet and smelling like pig poop again. The auditorium is full. Have to stand for the show. Kids are judged on their pig-walking abilities and pig-knowledge. It is a long competition, with Juniors, Intermediates and Seniors, 13 classes of each. Arena is cold, but barn is colder, and other people smell like pig poop too, so I don’t feel so bad. No awards. My son hangs with his friends and I explore the fair with my daughter, then slink off to the car to make her do her homework. She falls asleep reading in the sleeping bag. Awww! It’s been a long day already. Back at the barn, Choppy has decided she is a piglet again and attempts to hop onto my son’s lap for a cuddle (he’s sitting on a bucket in the stall). That’s over 300 lbs! Get out of there! Other kids have strung up hammocks in their stalls and are hanging out with their pigs. Note to self- bring a hammock next year! We wash Lucy again, as the orange dirt on the stall floor is not so kind to her pink coloring. Our son doesn’t want to wash Choppy again. 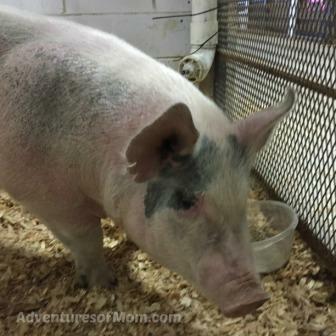 Our son finds out due to pig weight, he is in the first class in tonight’s show. Our daughter is in the 8th class. The barn is in a flurry before the show. Many of the buyers have arrived to check out the prime pigs prior to the auction tomorrow. Everyone except for competitors are booted from the barn. There are even cops patrolling the barn to chase non-competitors out! I find a seat in the arena. The smell of pig is strong – dang it, it is me! 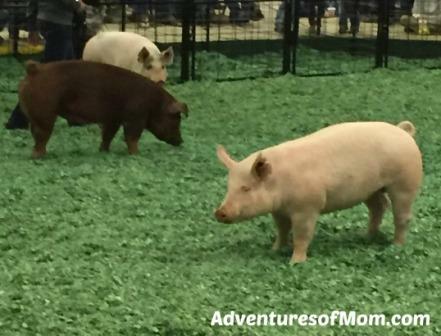 Choppy is the first pig pulled from Class One. Our son gets 2nd place in his class! Woohoo! I feel like I’ve won the lottery! 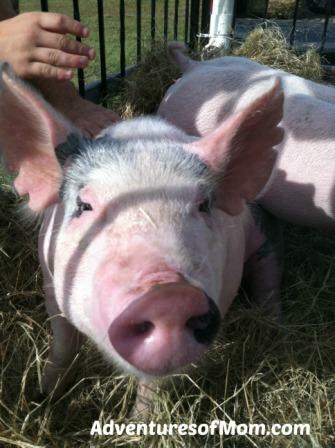 Choppy is one fine pig and they know it! Now my son has to wait to the end of the whole competition to see if he gets a chance at Grand Reserve Champion! 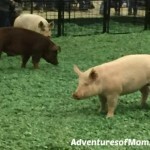 In the 8th class, Lucy is the first pig to run into the arena. She goes straight to the judge and bites the toe of his boot! He is not amused. Lucy wins no awards. No Grand Reserve for Choppy, but it is late and everyone is tired and just wants to go home. I wish we could camp there. Feed the pigs. They are exhausted from their arena runs. Drive home. Grab doughnuts on the way to the fair. Feel bad that the kids have been eating junk food all week: subway sandwiches, hamburgers and doughnuts. This is the last day! Lots of high school kids washing their pigs. I don’t push our kids to wash theirs. Am tired of being wet and smelling like pig poop. Kids don their show clothes. Choppy is one of the earlier pigs to be auctioned, Lucy is a lot later, according to the posted sheets. They have managed to eat all of their food and finished the bag! I go into the pen to give Choppy one last hug and Lucy an ear tickle and manage to step in pig poop. Great way to start the auction day! Choppy is auctioned fast and leaves the arena. I run out to the barn to find my son, knowing kids get emotional over the auction. He’s at the holding pen out back. Tell myself that I’ll be okay as long as I don’t go to that holding pen. Yeah, go to the holding pen. Our son is not there, but I see Choppy. She is picking on the pigs as they add them to her pen. I don’t feel bad, no emotion actually, until I see a tall older man in a cowboy hat walk up to the pen. Choppy walks over to him and he looks down at her and then nods and reaches over and pats her on the back. Then he saunters off towards the parking lot. I start crying. She was a good pig. Escape the holding pen and dry the tears. Time to watch Lucy go. My daughter comes to me, half of her white shirt covered in orange mud. Lucy having the last say. I try and clean it with paper towels, but this mud is set solid. There is nowhere to get a new shirt. She goes into the auction with her mud stains. And in another moment, Lucy is gone. Our daughter doesn’t cry. She doesn’t go to the holding pen either. I don’t go back to the holding pen. We get ice cream instead. Ice cream is good, right? We hang out with friends and then clean the stalls when the auction is over. One of the high school girls is crying. I remembered she cried last year too. “Are you showing a pig next year?” I ask her. She nods. “Why do you torture yourself like this?” I ask. “I’m going to see this through to the end,” she tells me. Another high school girl tells me she’s done with the fair, as she is a senior. She looks relieved. We load up our car. Everyone smells like pig poop now. The kids are excited on the drive home. They have worked so hard on this project and in the shows. I am a proud but sad mom. I can’t stand parting with any animals (except mean roosters) But with the kids, they shed no tears. Instead, they talk about what they will do differently with their pigs next year. “Wait, you’re doing this again?” I ask in disbelief. “Yeah mom, sure.” Our daughter says, knowingly. Little piglets are just so adorable…..